Sleep is a behavior that involves an immobile posture, decreased responsiveness to arousing stimuli such as noise and light, and rapid reversibility (the ability to quickly "wake up", as distinct from hibernation or a comatose state). The physiological criterion most frequently used to define sleep is the slowing down of "brain-waves" on an EEG. An EEG (electroencephalogram) measures electrical activity in your brain, which is caused by your brain cells talking to one another. 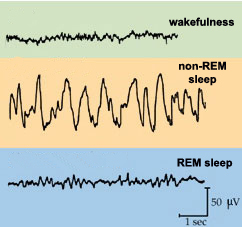 Brain activity, which happens even during sleep, appears as wavy lines on an EEG recording, hence brain 'waves'. 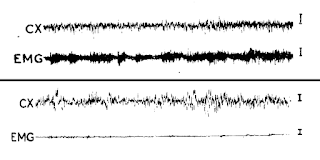 When mammals and birds are sleeping, they exhibit two alternating patterns of EEG activity: 1) slow-wave sleep (SWS, also called synchronized, quiet, or non-REM sleep), which is characterized by high amplitude (75-400 μV), low frequency (0.5-4 Hz) EEG waves, and 2) "paradoxical" sleep (PS, also called desynchronized, active, or REM sleep), which is characterized by low voltage (5-10 μV), high frequency (13-30 Hz) EEG waves that are physiologically more like those in awake animals (hence the name "paradoxical"). In humans and cats, paradoxical sleep is associated with rapid-eye movement (REM, measured by electro-oculography or EOG), complete muscle relaxation (measured by electromyography or EMG), muscle twitching, irregular breathing/heartbeat, and, in humans at least, with dreaming. Although sleeping patterns are enormously variable across the animal kingdom, most mammals and birds tested exhibit both SWS and PS, or variations on that theme. In some basal mammals and birds (echidnas, platypus, ostriches), eye movement and relaxed muscle tone are associated with both quiet and active sleep. Periods of rest or quiescence associated with EEG changes similar to those seen in mammalian sleep are clearly present in turtles and in crocodilians, but EEG data suggest that these animals do not exhibit REM sleep. 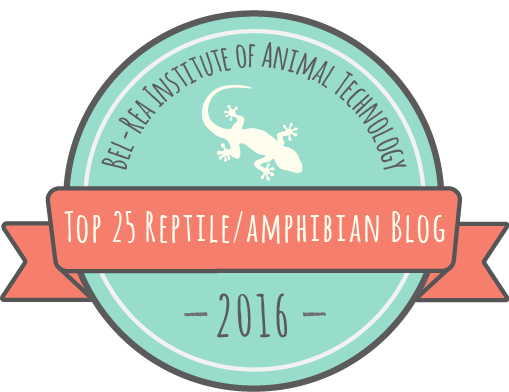 Some experiments have found REM-like sleep in lizards, whereas others have not. In experiments where lizards, turtles, and crocodilians were subjected to continuous arousal for 24-48 hours, they appeared to get tired, sleeping more afterwards and producing more high-voltage EEG spikes. Tortoises given the drug atropine, derived from the mandrake plant and used to produce deep sleep in humans since at least the fourth century B.C.E., also produced more spikes, suggesting that EEG spikes are in fact analogous signs of quiet sleep in reptiles and mammals. Interpreting EEG data is complicated because SWS waves differ between mammals and reptiles, perhaps because reptile and mammal brains differ in structure, particularly with respect to the neocortex, the source of these waves in mammals. Furthermore, some reptiles sometimes seem to exhibit sleep-like brain activity when they are awake, perhaps because ectotherms basically fall asleep when they get cold. The single study of a snake was done by French comparative sleep researchers J. Peyrethon and D. Dusan-Peyrethon (I could not find their full first names), who also studied sleep in fish, caimans, cats, and mice in the 1960s at the Laboratoire de Médecine Expérimentale in Lyon. They used EEG to monitor the brainwaves of a four-foot African Rock Python (Python sebae) over two days. They reported that sleep-like brain waves were produced almost 16 hours a day, increasing to over 20 hours following feeding, and that these brainwaves corresponded with slower breathing and heart rate, some muscle relaxation, and perhaps a lowered behavioral response threshold. They did not see any evidence for active sleep in the EEG. As far as I can tell, this is the only study ever conducted on sleep in a snake. Snakes do have circadian rhythms, and many snakes are active only at particular times of day. Racers (Coluber), hog-nosed snakes (Heterodon), patch-nosed snakes (Salvadora), and sipos (Chironius) are strictly diurnal, whereas aptly-named nightsnakes (Hypsiglena), broad-headed snakes (Hoplocephalus), and kraits (Bungarus) are strictly nocturnal. But many snakes do not fit nicely into these categories. Good examples include ratsnakes (Pantherophis) and many vipers, but many other snakes may be active at any time of the day or night, depending on the time of year, so it's hard to predict when or for how long they might be expected to sleep. You often observe snakes exhibiting sleep-like behavior, sitting in one spot for hours, days, or even weeks at a time, like the Puff Adder (Bitis arietans) in the video at left. But the thing is, that snake is actually foraging. A viper might sit motionless for many days, such a long time that if a mammal exhibited that same behavior, we might think it was sick or dead! But in fact this is how many snakes forage for prey, hyper-alert to their immediate surroundings, ready to ambush, strike, and envenomate small animals that stray too close. Do they sleep when they are waiting, or are they awake the entire time? Radio-telemetry studies of bushmasters (Lachesis muta) in the wild suggest that they might have strict cycles of attentiveness, "awesomely alert during darkness and almost as if drugged by day", with relatively abrupt transitions each way. On the other hand, many marine mammals and migratory birds do not seem to sleep for long periods of time without suffering any obvious consequences. When engaged in constant activity, these animals close one eye and sleep one half of their brain at a time. Other animals, including perhaps some lizards, sleep one hemisphere at a time in contexts of high predation risk. Might snakes that use sit-and-wait foraging strategies do something similar? like using a small aperture on a camera lens. If lyresnakes sleep, it's probably during the day. How would a researcher tell if a snake was sleeping? Snakes never close their eyes. 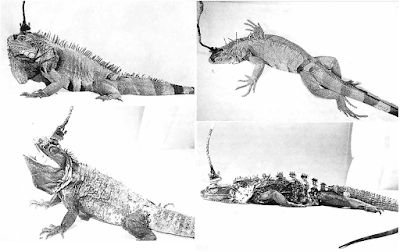 Or, more accurately, their eyelids are always closed, but they are covered by clear scales. Either in the wild or in captivity, observations of snakes seeming to "wake up" (implying that they were sleeping) are rare: motionless snakes rarely twitch, and other signs of PS are either normal for snakes (such as irregular breathing/heartbeat) or anatomically impossible (REM). You could imagine a series of experiments where an experimenter used EEG and high-speed infrared videography to record the brainwaves and behavioral responses of snakes to arousing stimuli. What stimuli to use is an open question, since snakes don't necessarily respond to bright lights or loud noises even when they're awake. Because snakes inhabit a primarily chemosensory world, it might be possible to wake one up using a smell. The human experience would suggest that the onset of chemosensory signals is inherently too gradual to really be surprising, but this might or might not be true for snakes. What about the infrared sense of some snakes? Could a bright infrared light wake them up? Can snakes see when they're asleep? What would that even be like? Only further studies will tell for sure. So here's what we know: snakes probably do sleep, perhaps most of the time, but we don't really know when, for how long, how deeply, or whether or not they have paradoxical sleep, including dreaming. Sleep patterns are probably quite diverse across the >3500 species, of which only one has been examined. Many snakes do yawn, but this has been interpreted either as a means to gather chemical cues or to reposition musculoskeletal elements, in contrast with the hypothesized functions of yawning in humans (possibly regulating brain temperature, causing increases in blood pressure, blood oxygen, and/or heart rate in order to improve motor function and alertness, or as a social cue). Sleep is such a basic element of human biology, so if you ask me, the subject of sleep in snakes, and broader questions about the diversity, evolution, and function of sleep across the animal kingdom, should be keeping researchers awake at night. Thanks to Kendal Morris for suggesting this question, and to Harry Greene, David Cundall, and Gordon Burghardt for sharing their observations. Greene, H. W., & Santana, M. 1983. Field studies of hunting behavior by bushmasters. Estudios de campo del comportamiento de caza por parte de las cascabelas mudas. American Zoologist 23:897 <link>.